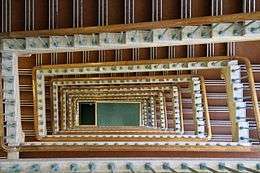 This article is about the building in London. For the building in Bristol, see Arnolfini. For other uses, see Bush House (disambiguation). Bush House is a Grade II listed building between Aldwych and the Strand in Central London at the southern end of Kingsway. 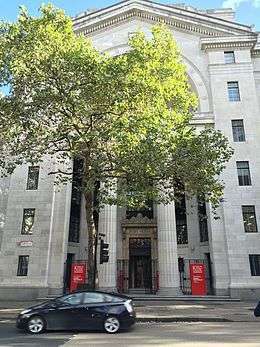 Now part of the Strand Campus of King's College London, Bush House previously served as the headquarters of BBC World Service. The broadcast from Bush House lasted for 70 years, from Winter 1941 to Summer 2012. The final BBC broadcast from Bush House was the 12pm BST English bulletin on 12 July 2012. The BBC World Service is now housed in Broadcasting House in Portland Place. King's College London has taken over the premises since acquiring the lease in 2015. Sections of Bush House were completed and opened over a period of 10 years: Centre Block was opened in 1925, North-West Wing in 1928, North-East Wing in 1929, South-East Wing in 1930, and South-West Wing in 1935. The full building complex was completed in 1935. The building was commissioned, designed and originally owned by American individuals and companies. Irving T. Bush gained approval for his plans for the building in 1919, which was planned as a major new trade centre and designed by American architect Harvey Wiley Corbett. The construction was undertaken by John Mowlem & Co. At least one stonemason, Frederick Horton (died 17 Sep 1920, age 50) is known to have died during the construction, but overall the building had a very good safety record. The building's opening ceremony was performed by Lord Balfour, Lord President of the Council, on 4 July 1925. It included the unveiling of two statues at the entrance made by American artist Malvina Hoffman. The statues symbolise Anglo-American friendship and the building bears the inscription "To the friendship of English speaking peoples". Built from Portland stone, Bush House was in 1929 declared the "most expensive building in the world", having cost around £2,000,000 ($10,000,000). In January 1930, during the Bush House excavations for the South-East Wing, a marble head was uncovered from a pile of rubble. The head is an elderly, balding Roman man carved from Carrara marble. He has a finely chiselled face and a rather grim irritated expression. The point of his nose has been broken off, and his ears have been damaged. There are various ideas to its origin. It could be a remnant from a Roman bath or villa outside the walls of Roman London, or it could have been an Italian copy imported in the 18th century and used as a garden ornament. Old maps of the area show a large house occupying a site close by. The marble head is now on display in the Centre Block of Bush House. The BBC European Service moved into the South-East Wing of Bush House after two Luftwaffe 800 pound bombs damaged Broadcasting House on 8 December 1940. The move was completed in 1941 and the BBC Overseas Service followed in 1958. The BBC World Service occupied four wings of the building. In 1944 Bush House suffered external damage from a V-1 flying bomb dropped on Aldwych. One of the Bush House statues lost an arm. The statue remained damaged until 1970 when an American visiting his daughter at the London School of Economics, which is nearby, saw the damaged statue. 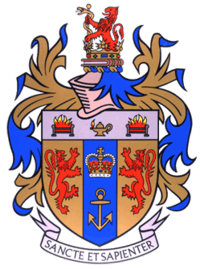 He worked for the Indiana Limestone Company and persuaded the company to send a new arm and a stonemason to attach it in time for the Silver Jubilee celebrations of Queen Elizabeth II in 1977. The North-West Wing was formerly occupied by BBC Online until they relocated to the BBC Media Village in 2005, with some studio and office space being retained until 2008. Following its ongoing expansion and renovation programme known as the W1 Project, the BBC also moved its World Service to Broadcasting House. The final broadcast from Bush was the 12:00 BST bulletin on 12 July 2012. All subsequent bulletins now come from Broadcasting House. The BBC's lease with Kato Kagaku (the Japanese company that owns the building) expired at the end of 2012, with the keys to the building being handed over in a ceremony marking the end of the BBC World Service residency. Refurbishments are taking place under the management of Jones Lang LaSalle and Interior Services Group (ISG). John Robertson Architects has been appointed as the architectural firm undertaking this refurbishment. The stairways and lift lobbies will be refreshed but retain their existing finishes, and the external stonework will be cleaned. For most English-language shortwave listeners (during the Cold War and after), Bush House has always been the unquestioned BBC World Service home. Although the Bush House complex was not designed for international broadcasting in the way Broadcasting House was, it nevertheless is perceived by many broadcasting professionals as being the stereotypical international broadcasting centre. ↑ Historic England. "BUSH HOUSE CENTRE BLOCK WITH FLANKING COLONNADES (1066492)". National Heritage List for England. Retrieved 26 June 2015. 1 2 "The history of Bush House". King's College London. Retrieved 25 February 2016. ↑ Mowlem 1822 – 1972, p. 6. ↑ Conversation Forum for Bush House, London, UK, h2g2. H2g2.com. ↑ BBC Buildings: Bush House. BBC. (1 January 1970). ↑ Roman Head on Flickr. 1 2 "Why is the HQ called Bush House?". Frequently Asked Questions. BBC World Service. Retrieved 25 February 2016. ↑ The BBC Story: Bush House. BBC. ↑ "Bush House Consigns Keys to Kato Kagaku", Jones Lang LaSalle, 14 December 2012. Joneslanglasalle.co.uk (14 December 2012). ↑ Klettner, Andrea. 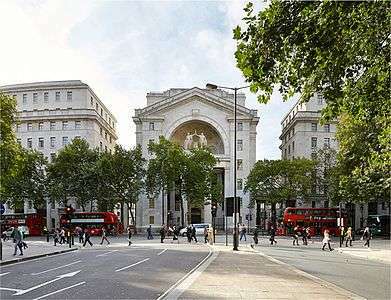 (2 August 2012) John Robertson Architects appointed for Bush House refurb | News | Building Design. Bdonline.co.uk. ↑ "Aldwych Quarter". King's College London. Retrieved 25 February 2016. "World Service staff bid farewell to iconic Bush House", World Radio and TV, BBC News.